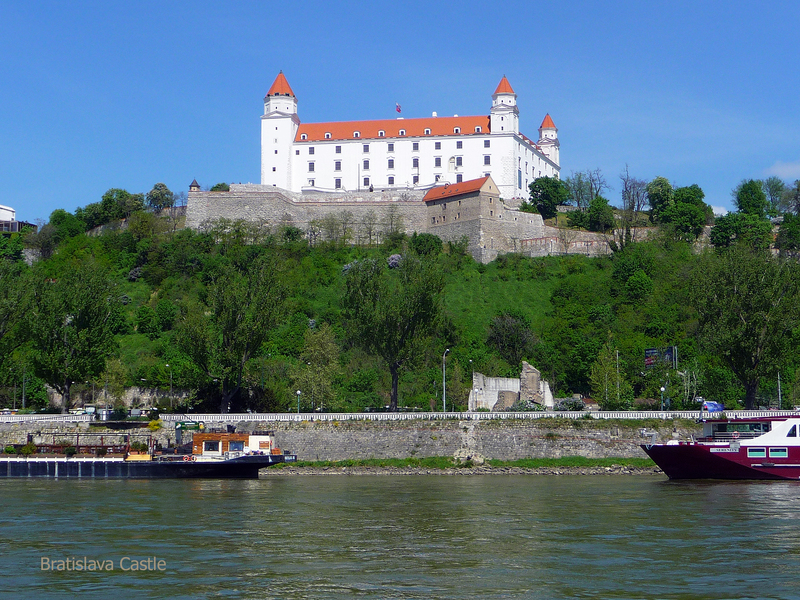 Bratislava sits on the banks of the Danube backed by the forested hills of the Small Carpathians, and with less than half a million inhabitants, it contrasts beautifully with both Vienna and Salzburg which are near neighbours. Instead of sophistication and modernity, Bratislava offers an old-world charm and courtesy, and a way of life that allows time for relaxation in the coffee shops that are as ubiquitous here as in Vienna, and evening entertainment in the form of opera, ballet, classical music and jazz, drinking in traditional old pubs or dining in a range of classy restaurants. It could be Europe’s most relaxed city as well because it has retained its human scale having been spared the development and urban sprawl that afflicts other parts of the continent. One need not spend time poring over maps on street corners, or hours finding one’s way in and out of metros or looking for the right bus to take one on to the next ‘must see’. All this, plus the Danube, which is one of the city’s main assets, makes Bratislava my current favourite capital. 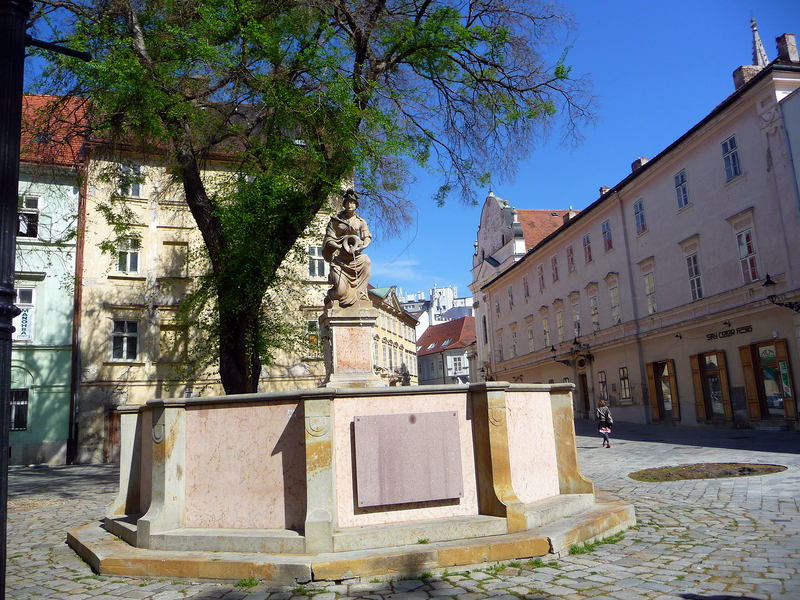 The city has a long and proud history that dates back to pre-Roman times and although much has been destroyed there are still traces of some of the people who lived here, Celts, Romans, Germans, Hungarians and, of course, Slovaks. Their influences can be seen not only in the architecture but in the cuisine and the startlingly good wines on offer. On the edge of the city, the vineyards on the hillsides have been producing wine for centuries and quite close to Bratislava are wine towns where you can taste the wines before buying. In its small historical centre the charm is concentrated. Some ten years ago they started to renovate the streets and the houses (although some are still awaiting an overhaul), and that their efforts have paid off is obvious in the multitude of cafes, bars and restaurants that have sprung up alongside souvenir shops and fashion stores. Most cafes have outdoor seating on the pavement and on warm days the tables will be bustling with life, giving the city a very Parisian atmosphere. 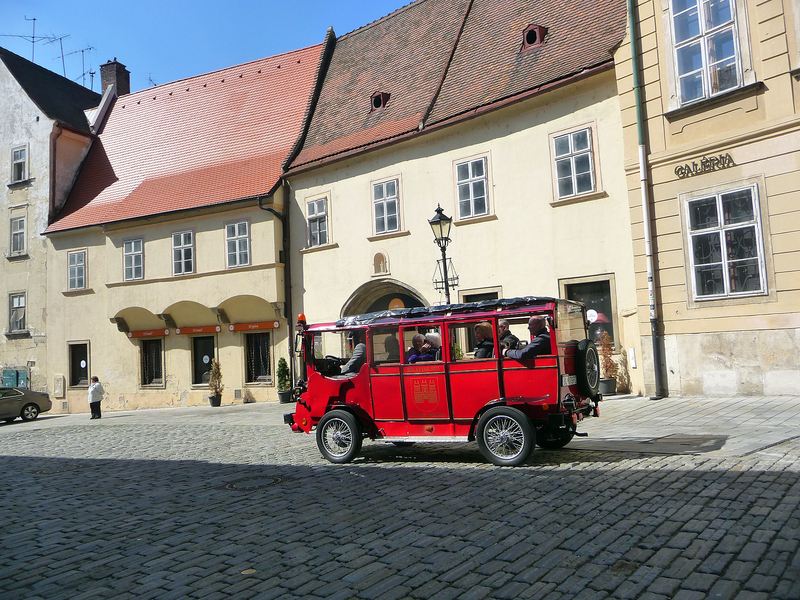 The Old Town is the place to stroll the narrow pedestrian streets lined with 18th-century buildings: many have been beautifully restored, but some are still in the process. 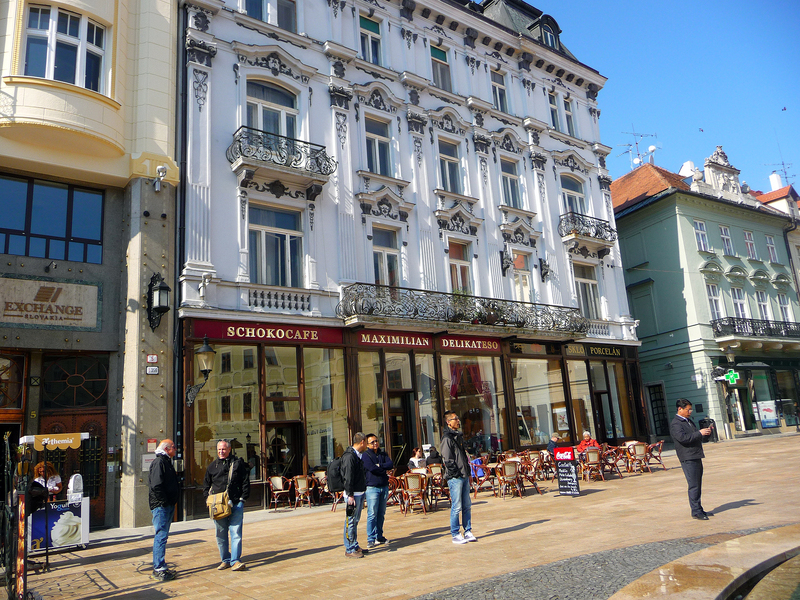 The many sidewalk cafes that lie under the gaze of the Stone Age city castle (high up on a hill from which are great views over the old town and the Danube) are great for people watching. 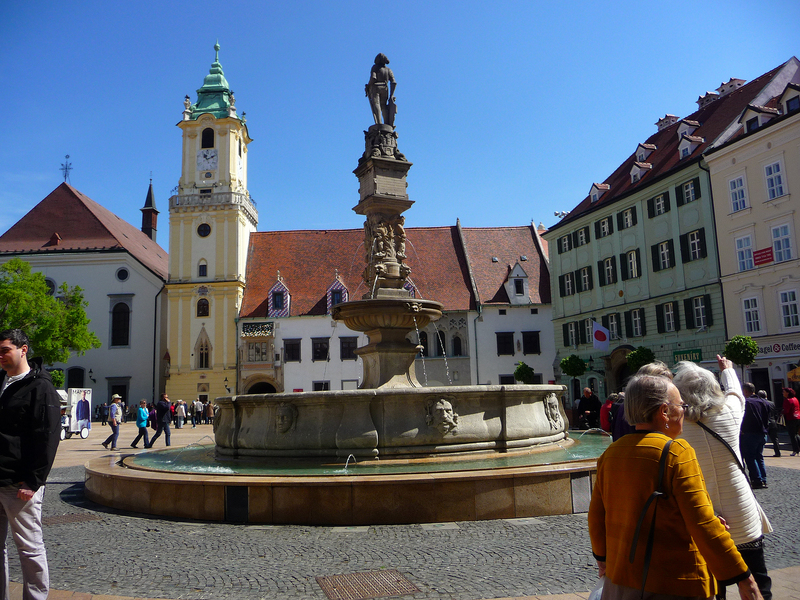 The main square, a picturesque 13th-century quadrant, is flanked by pastel-colored houses and hosts the 15th-century Old Town Hall: nearby are Roland’s Fountain (the most famous fountain in Bratislava as well as one of the city’s important landmarks), St. Michael’s Gate (the only remaining gate of the medieval fortification of the city), and the 14th century St. Martin’s Cathedral which saw the coronation of 11 Austro-Hungarian monarchs. 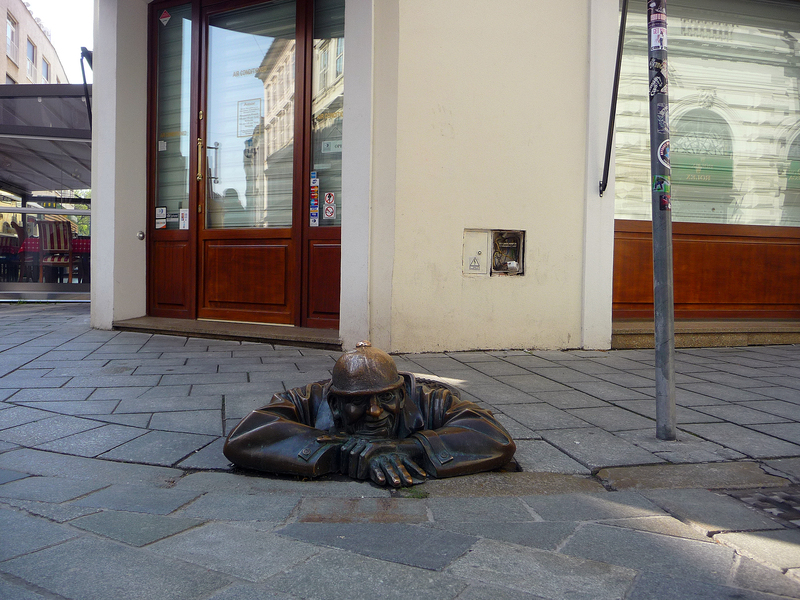 A feature of the Old Town are bronze sculptures, but not as one imagines sculptures, these are quirky works, workmen emerging from the pavement, soldiers standing supporting lamps, and figures leaning on benches (see below). In the middle of the main square is Schokocafe Maximilian, an elegant coffee-chocolate house with a reputation second to none. 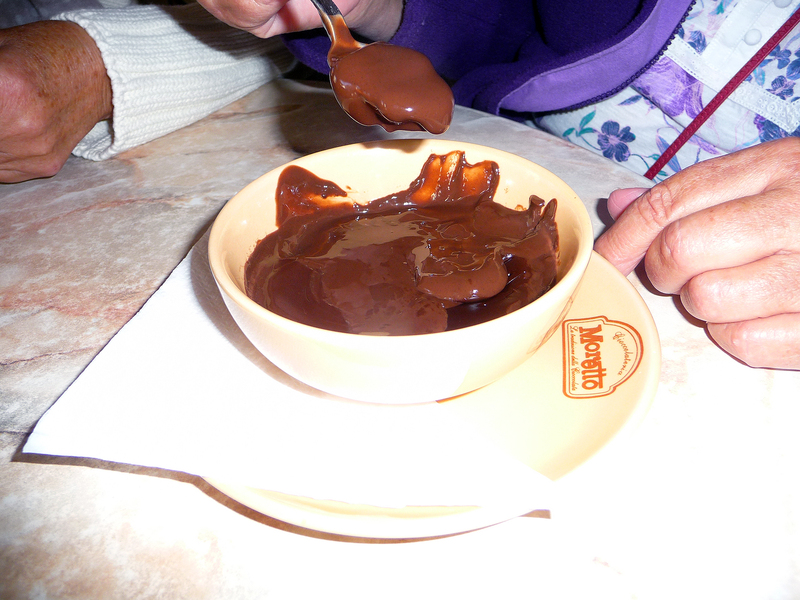 I had read about the famous chocolate served in this establishment and was looking forward to my very special ‘hot chocolate’. That is exactly what I had, hot chocolate, but oh, how disappointing. 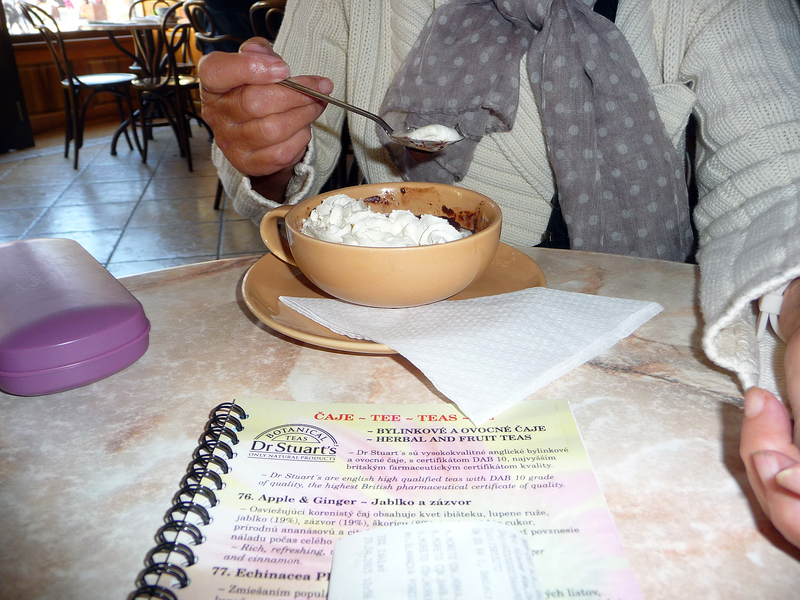 Maximilian’s hot chocolate is not a drinking chocolate as we know it, rather is it a chocolate pudding, a mousse (but more dense), so thick that I could stand my spoon up in it, literally. I ordered cream in an effort to thin it down but this didn’t work either. 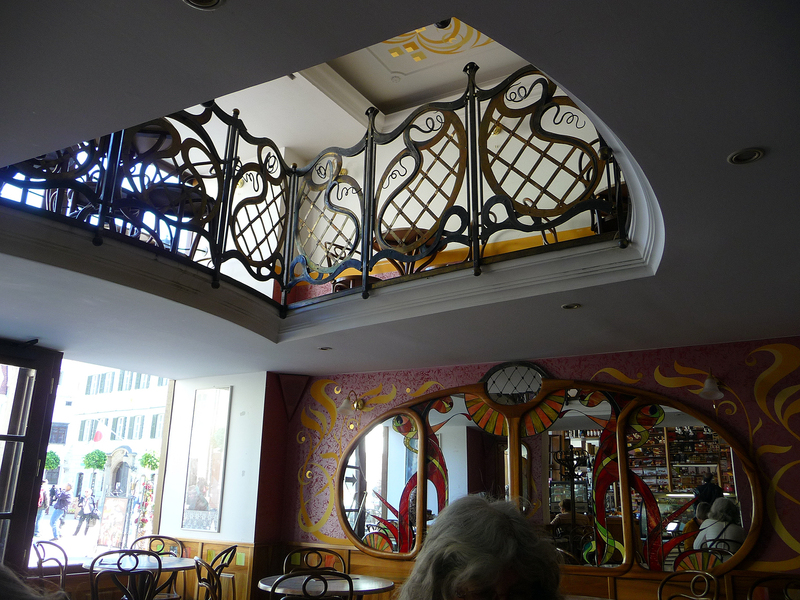 Take my advice and have a coffee, admire the glorious wall to ceiling chocolate counter and the Art Nouveau interior or sit outdoors and admire Roland’s fountain and the old Town Hall, just two of the places to see and photograph. And if it is raining, or the weather is cold, then add a dash to the coffee of one of the local spirits such as the herbal liqueur Demänovka, or the gin-like borovička or the more famous slivovica which is made from plums for warmth. Traditional pubs are a feature of Bratislava and most socialising is done in these places, some of which are large and noisy, some small and intimate and some very modern. I liked the ones housed in the city’s ancient cellars, the really traditional ones, as these are dying out in many parts of the continent. Just look for the beer sign and then head down the stairs. Several are housed in the city’s ancient cellars – look for a sign advertising beer, and head down the stairs. And although the beer is of high quality, its wine producing means that good wines are always available even in the brashest pub. 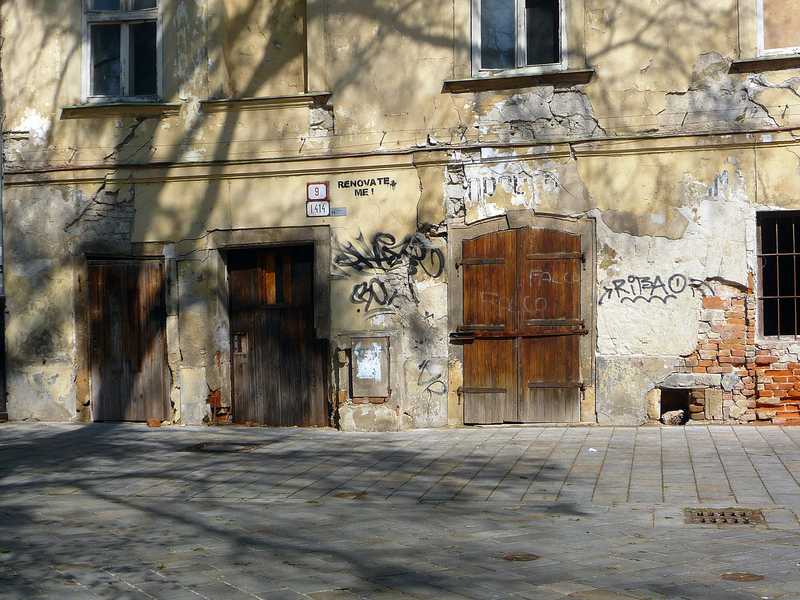 But Bratislava is not only about café-culture. It is also the sporting capital of Slovakia with the country’s biggest football and ice hockey teams and a purpose-built white-water rafting centre on the Danube. Popular with walkers and cyclists, its location on the slopes of the Small Carpathian hills mean there is a wide range of hiking opportunities within the city itself and in the surrounding area where forested hillsides comprise almost one-quarter of the city’s area. For mountain-bikers the region if filled with trails but even if you are not a biker, a network of sealed walking and cycling paths through the woods leads to historic towns such as Stupava and Sväty Júr. Best place to start is the Železná Studienka valley, a short way out of the town which can be accessed by train from the main railway station (to Bratislava- Železná-studienka station) if you prefer not to negotiate the town. A trail leads up the tree-lined valley, passing several lakes and at the top a cable car connects the top of the valley to the hill-top at Koliba. Or, take the number 203 trolleybus from Hodžovo námestie (in front of the Presidential Palace), in the direction of Koliba. Go right to the end and walk up the hill in front into the forest and the trail emerges at a clearing dotted with bars and cafes. 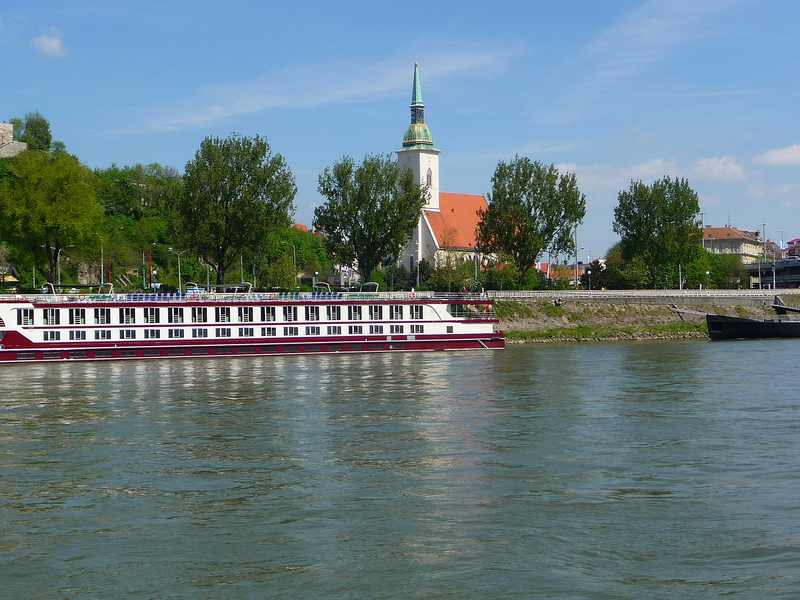 The River Danube that winds through town is one of Bratislava’s great assets and it is a magnet for walkers, cyclists, inline skaters, and strollers who come to watch the commercial riverboats that cruise the river and the high speed catamaran that links Bratislava and Vienna several times a day during summer. For cyclists, a particularly popular ride is out to the Danubiana Meulensteen Art Museum at Čunovo from where it is possible to catch a boat back to the city. 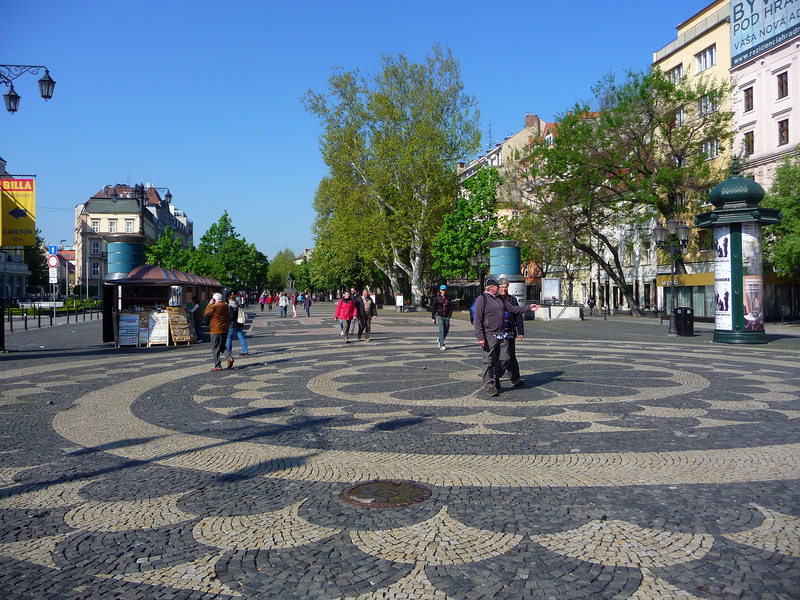 Bratislava may be a small capital city, but it offers a lot to the visitor. 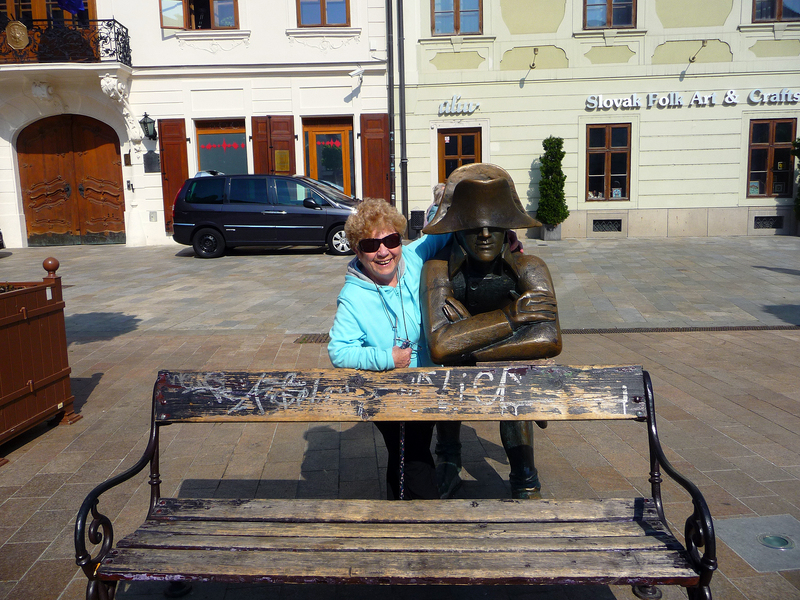 Slovakia has a particularly rich folk culture, and this can be seen in the local woodwork, ceramics, textiles and music. 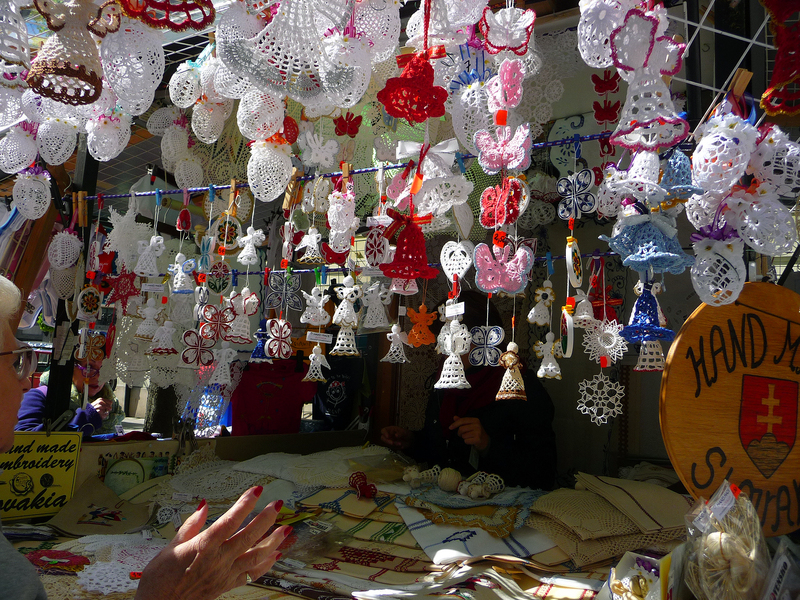 The people are proud of their heritage, and several shops offer a range of locally produced, quality goods, ranging from the distinctive blue and yellow pottery to hand embroidered children’s clothes and houehold linens, modern glassware and traditional wooden items. The best time to see traditional hand-crafted goods is at the Christmas Markets but go anytime to this lovely city and enjoy the produce, the crafts and the hospitality – but watch out for the chocolate. My Favourite Spot. 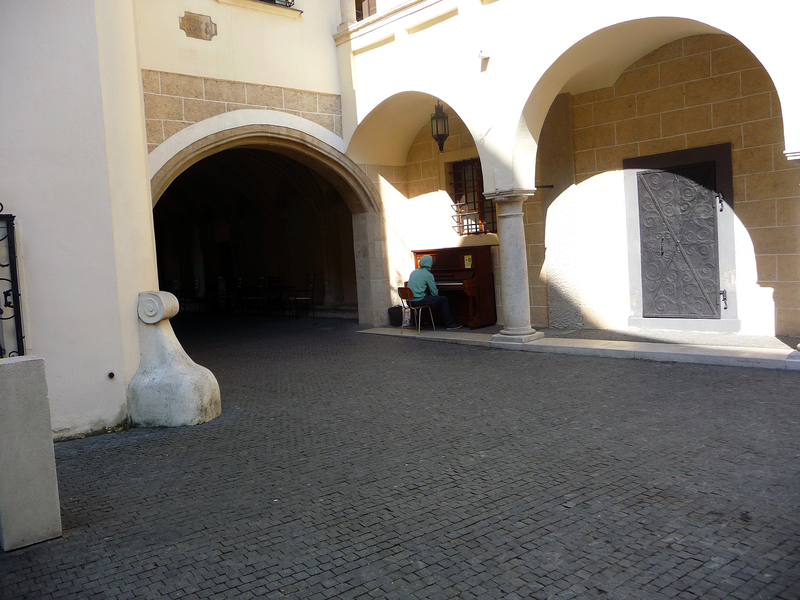 A Piano left under an archway for practice purposes for students who had no instrument of their own. You have a rare gift of really bringing an unknown place alive and stirring the readers’ wanderlust. Praise indeed from someone whose many books I have read and whose Biographies blog I follow. Thank you.